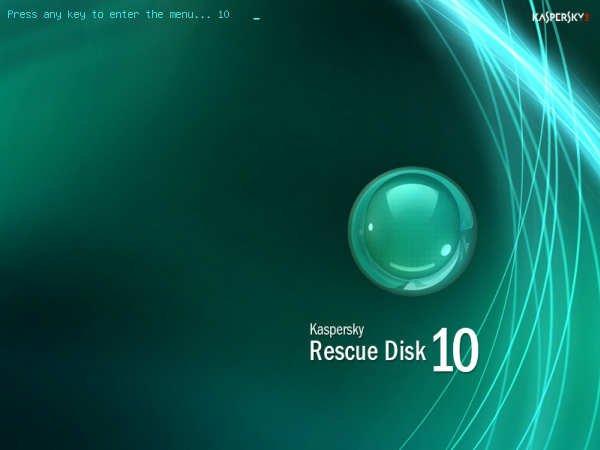 A Rescue Disk should be used in case of an infection that cannot be cured by means of antivirus software or disinfection utilities (for example, Kaspersky AVPTool) running under operating system control. Antiviral treatment is more effective in this case, because the malware which infected the system cannot not gain control in the process of operating system startup. An ISO image is a .iso file with an image of a CD/DVD disk. If used via special software, it can substitute optical disk. * Locally, from a CD/DVD-ROM disk. The PC must have a CD/DVD-ROM drive. * Remotely, from administrator workstation or another networked PC. * Configure the PC to boot from CD/DVD-ROM drive in BIOS (see your motherboard documentation for details). * Insert a disk with a written Rescue Disk image into CD/DVD-ROM drive of the infected PC. · Options of the network configuring (including Wi-Fi and Wi-MAX) has been enhanced. · Computer loading from a USB-drive has been improved. · Boot speed of a distributive has been improved. · Work in the graphic and text modes has been improved. · Program modules have been updated. · Kernel of the operating system has been updated. · Third-party program packages have been updated. All Kaspersky Rescue Disk reviews, submitted ratings and written comments become the sole property of Windows 7 download. You acknowledge that you, not windows7download, are responsible for the contents of your submission. However, windows7download reserves the right to remove or refuse to post any submission for any reason. Windows 7 Download periodically updates pricing and software information of Kaspersky Rescue Disk full version from the publisher, but some information may be out-of-date. You should confirm all information. Using warez version, crack, warez passwords, patches, serial numbers, registration codes, key generator, pirate key, keymaker or keygen for Kaspersky Rescue Disk license key is illegal and prevent future development of Kaspersky Rescue Disk. Download links are directly from our mirrors or publisher's website, Kaspersky Rescue Disk torrent or shared files from free file sharing and free upload services, including Rapidshare, MegaUpload, YouSendIt, SendSpace, DepositFiles, DivShare, HellShare, HotFile, FileServe or MediaFire, are not used.